That’s pretty much unequivocal, right? President Donald Trump complaining about a “witch hunt” consisting of an official investigation of him, for obstruction of justice. Blammo. Except that, as Seth Meyers pointed out on last night’s Late Night, Trump is totally not under investigation, at least according to Jay Sekulow, one of the no doubt many, many lawyers Trump will employ for as long as he’s in office. Unless he is under investigation. Or unless no one can know for sure. For an explanation of this conundrum, look at the header image of CNN’s Jake Tapper, trying diligently to parse the bafflingly contradictory statements Sekulow made while making the TV rounds in an attempt to definitively state that his client, Donald Trump, is either under investigation, or not under investigation, or—in some quantum legal singularity—both or neither at the same time. 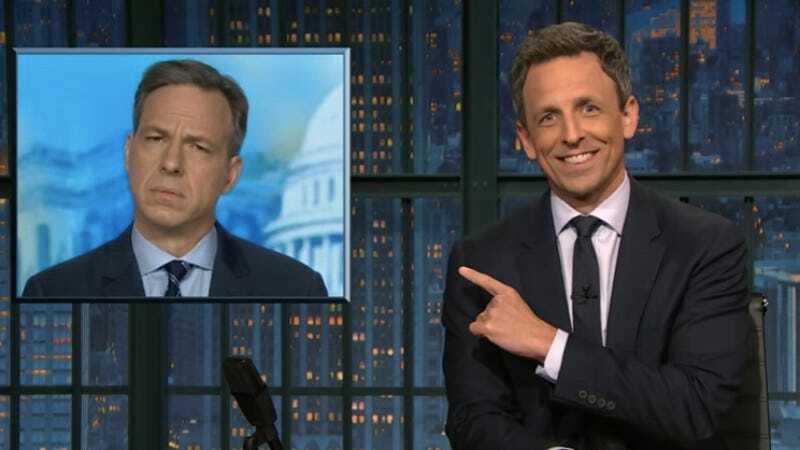 Meyers described Tapper’s demeanor as that of a guy trying really hard to give one of those magic eye paintings the benefit of the doubt, but, in another clip, Tapper’s colleague, Fox News’ Chris Wallace, simply wasn’t having it. “Oh boy, this is weird,” exclaims the exasperated Chris Wallace in the end. Meyers, having shown how reportedly soon-to-be ex-press secretary Sean Spicer has repeatedly touted Trump’s tweets as the raw, unfiltered, presidential truth, similarly presents this latest debasement of all that is factual with the amused/horrified smile of one confronted, finally, with an administration where observable truth simply means nothing.